In nearly every moment of our waking lives, we face a barrage of advertising enticements, branding efforts, sponsored social media, commercials and other efforts to harvest our attention. 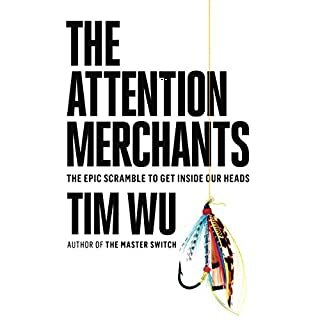 Over the last century, few times or spaces have remained uncultivated by the "attention merchants", contributing to the distracted, unfocused tenor of our times. Tim Wu argues that this is not simply the byproduct of recent inventions, but the end result of more than a century's growth and expansion in the industries that feed on human attention. We live in an age of extreme corporate concentration, in which global industries are controlled by just a few giant firms - big banks, big pharma, and big tech, just to name a few. But concern over what Louis Brandeis called the "curse of bigness" can no longer remain the province of specialist lawyers and economists, for it has spilled over into policy and politics, even threatening democracy itself. Is the Internet erasing national borders? 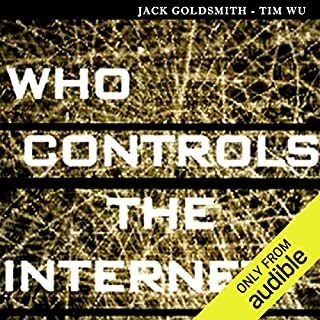 Who's really in control of what's happening on the Net--Internet engineers, rogue programmers, the United Nations, or powerful countries?In this provocative new book, Jack Goldsmith and Tim Wu tell the fascinating story of the Internet's challenge to governmental rule in the 1990s, and the ensuing battles with governments around the world. The Internet was never intended for you, opines Brian McCullough in this lively narrative of an era that utterly transformed everything we thought we knew about technology. 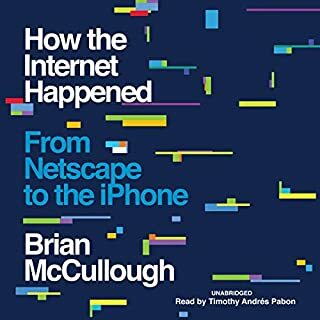 In How the Internet Happened, he chronicles the whole fascinating story for the first time, beginning in a dusty Illinois basement in 1993, when a group of college kids set off a once-in-an-epoch revolution with what would become the first "dotcom". Behind every great revolution is a vision, and behind perhaps the greatest revolution of our time, personal computing, is the vision of J.C.R. Licklider. 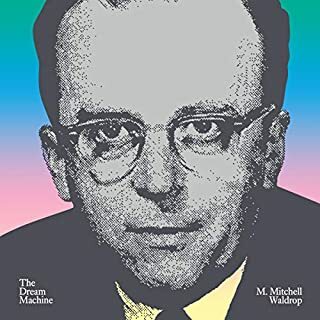 In a simultaneously compelling personal narrative and comprehensive historical exposition, Waldrop tells the story of the man who not only instigated the work that led to the internet, but also shifted our understanding of what computers were and could be. Too often we feel like underdogs fighting a system that stacks the odds against us. We work hard, follow the rules, and dream of a better life. But these days, working harder doesn't always lead to fulfillment. In fact, according to Gallup research, nearly 90% of people feel disconnected from their jobs. So how do you break free from the drudgery and achieve more success on your own terms? You hustle. In this book, Amy Webb reveals the pervasive, invisible ways in which the foundations of AI - the people working on the system, their motivations, the technology itself - is broken. Within our lifetimes, AI will, by design, begin to behave unpredictably, thinking and acting in ways which defy human logic. The big nine corporations may be inadvertently building and enabling vast arrays of intelligent systems that don't share our motivations, desires, or hopes for the future of humanity. In a fascinating account combining policy expertise with compelling on-the-ground reporting, Susan Crawford reveals how the giant corporations that control cable and Internet access in the United States use their tremendous lobbying power to tilt the playing field against competition, holding back the infrastructure improvements necessary for the country to move forward. And she reveals how cities and towns are fighting monopoly power to bring the next technological revolution to their communities. What do Google, Snapchat, Tinder, Amazon, and Uber have in common, besides soaring market share? They're platforms - a new business model that has quietly become the only game in town. A platform, by definition, creates value by facilitating an exchange between two or more interdependent groups. So, rather than making things, they simply connect people. The advent of mobile computing and its ubiquitous connectivity have forever altered how we interact with each other. Yet, few people truly grasp the radical structural shifts of the last 10 years. From acclaimed tech writer Clive Thompson comes a brilliant anthropological reckoning with the most powerful tribe in the world today, computer programmers, in a book that interrogates who they are, how they think, what qualifies as greatness in their world, and what should give us pause. They are the most quietly influential people on the planet, and Coders shines a light on their culture. Twenty-five years ago, it didn't exist. Today, 20 million people worldwide are surfing the Net. Where Wizards Stay Up Late is the exciting story of the pioneers responsible for creating the most talked about, most influential, and most far-reaching communications breakthrough since the invention of the telephone. In the 1960s, when computers where regarded as mere giant calculators, J.C.R. Licklider at MIT saw them as the ultimate communications devices. In this new audiobook, Stubborn Attachments: A Vision for a Society of Free, Prosperous, and Responsible Individuals, Cowen argues that our reason and common sense can help free us of the faulty ideas that hold us back as people and as a society. Stubborn Attachments, at its heart, makes the contemporary moral case for economic growth and delivers a great dose of inspiration and optimism about our future possibilities. A secret history of the industrial wars behind the rise and fall of the 20th century's great information empires - Hollywood, the broadcast networks, and AT&T - asking one big question: Could history repeat itself, with one giant entity taking control of American information? Most consider the Internet Age to be a moment of unprecedented freedom in communications and culture. But as Tim Wu shows, each major new medium, from telephone to cable, arrived on a similar wave of idealistic optimism only to become, eventually, the object of industrial consolidation profoundly affecting how Americans communicate. Every once-free and open technology was in time centralized and closed, a huge corporate power taking control of the master switch. Today, as a similar struggle looms over the Internet, increasingly the pipeline of all other media, the stakes have never been higher. To be decided: who gets heard, and what kind of country we live in. Part industrial exposé, part meditation on the nature of freedom of expression, part battle cry to save the Internet's best features, The Master Switch brings to light a crucial drama rife with indelible characters and stories, heretofore played out over decades in the shadows of our national life. Tim Wu, a scholar of technology, innovation and cyberspace has produced a very informative book which is timely in many ways. He relates in detail how communication technology has been guided by the profit motive and political actions during the last century and the current era. I have heard some of these stories before, but not in this context. If you are interested in or concerned about the direction that electronic media is taking in the US, this is the book for you. It is not light reading, but well worth the time spent. I found the first few chapters a little tedious largely because they were not covering what I was I thought were my interests. After a while, however, I realized what Wu was saying and by the last third of the book he had "my earlobes in his hands." I would, however, recommend that you listen to the Audible recording of Wu's earlier book, "Who Controls the Internet? ", first for background. This book will fill in the details and more. Well written and accessible. Marc Vietor's narration is excellent. I've never heard of Tim Wu before reading this, but he really knows his stuff as far as media/technology history goes. The best parts of this book were examining this history of prior "cutting edge" media (Telephony, Radio, Television) through the eyes of what we'd now call the "Open Source" vs. "Closed System" dynamic. Fascinating and informative. I found I couldn't put it down. HOWEVER -- the last hour turns into a very biased analysis of what's going on today. I take his larger point -- that the Internet's open-ended structure which we tend to think of as permanent is not, in fact, unassailable. I think it's a well-supported point and he makes some interesting conjectures as to how that structure could change. But I feel he makes a serious error in his analysis. Specifically, he reduces "fate of the communications future" to a simple dynamic: Apple vs Google, with his preference clearly falling on Team Google. I think this a fairly short-sighted, narrow interpretation. Unlike the Bell of RCA companies of yesteryear, *neither* company owns anything that could not be replaced through a process of consumer demand. (Neither owns the "wires") Apple is not the "too big to fail" monopoly that Bell was -- it just plays nicely with the companies that are. So while these two companies clearly have different ideologies vis-a-vis the internet, BOTH could be undone by a vertically integrated powerhouse! Further, as another reviewer points out, it assumes an American dominance of the communications future. And, like it or not, the Internet has wrested that ability from any one nation. Let's assume that "Comcast-NBC-Verizon-Apple-Intel-Universal" (Hypothetical Conglomerate) were to make the internet "controlled" in the USA. This would be such an economic disadvantage the the US, that new pioneer firms would pop up in more free information markets. This will always serve as a disincentive towards central control. My griping aside -- I can heartily recommend this book. Take some of the analyses with a grain of salt and make up your own mind -- but don't skip this book simply because it draws some dodgy conclusions. You'll learn a lot and it will make you think. 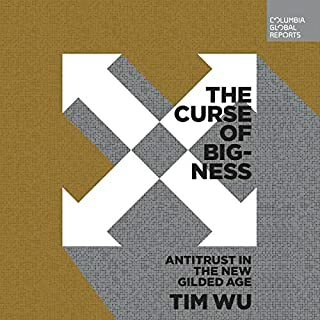 Wu does a masterful job of documenting the tyrants of communications and how they manipulate the political and legal system to stifle competition and twist the marketplace to their benefit at the expense of the rest of us. The stories are fascinating and the lessons instructive. Highly recommended. Where does The Master Switch rank among all the audiobooks you’ve listened to so far? 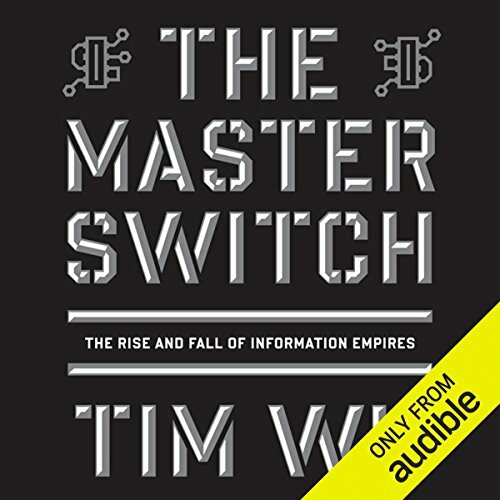 Master Switch is a modern history book about the rise and fall of information and the technology (and people) that facilitated it. As a technologist I find it to be a required listen for anyone interested in technology and media with the hope that there are many lessons to learn. How Tim Wu takes the listener on a tour of the history of information technology and the communication empires that it spawned such as telephone, radio, television and now those that evolved from the internet and mobile spaces. The depiction of Edison and David Sarnoff were quite interesting. However, it wasn't specifically due to Marc's narration. The book is too dense to listen in one sitting. I found that I would listen to passages and then reflect on them later. There were a few chapters that I listened to more than once. In another great book from Tim Wu after Who controls Internet , takes on a ride of technology as if we had gone back in time with main actors of story. It has been a interesting read as I have completed part 1 in one go. I needed a good tech read and this title what my interest called for. Tim Wu went beyond at doing his homework for this book. The Master Switch needs to be an requirement for any communication class. The book force us to look on an open network. Great read!!! I was hook. This book makes an historical argument that the natural evolution for information industries is a succession of generations, where each generation starts with an open disruptive innovation that at some point transitions to a closed monopoly (or duopoly). The book then expands on this model, by showing a few common, but less natural (i.e., forced) variations on this pattern. The first variation is where the established monopoly destroys the new industry in it infancy (usually involving some criminal thuggery and a good deal of predatory pricing and/or price fixing), thus co-opting the disruption. A less common variation is where the government steps in to breakup or limit the anti-social behaivor of a monopoly. The book then argues that the Internet is historically unique among information industries, because it has created horizontal monopolies (like Google) instead of the traditional vertical monopolies (like ATT or NBC at their peeks). The result is a much more openness for the same level of industry maturity, which is mostly good for society. The author seems deeply ambivalent about rather this is a stable situation. It presents a rather strong set of arguments for the idea that sometime in the next 10 year (approximately) the Internet will probably transformed from the ?? ?Wild West??? into a closed monopoly much more like TV in the ???70s. But in the end the author is unsure that the Internet is not somehow fundamentally different, so he argues that, while this possibility should be taken far more seriously than most do, the actually outcome is approximately unknowable. Nevertheless, he embraces the idea that society should want the internet to remain open and should be willing to make changes to ensure that this happens. 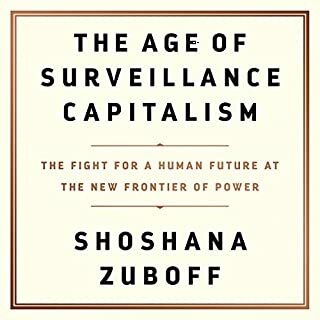 Thinking about the internet in the context of the long history of abusive monopolistic practices in U.S. information industries is a surprisingly useful. This is one of the better books I?? ?ve read this year. This book presents a comprehensive history and analysis of the modern US communications market, from the invention of the telephone, to the internet today. Over and over a monopoly is born, new technology rises and attempts to overthrow it, but often fails, but the monopoly eventually collapses, letting the new kids take over. The role of government in sustaining these monopolies and quashing competition is particularly illuminating, especially considering the free-market ethos so central to US thinking. It's all very interesting, and I feel I learned a lot from it. Two caveats, though: the narration is merely adequate, and sometimes feels wooden and forced. It didn't seriously bother me, but a better performance would have helped. Second, and this is important to remember, Wu discuss the US market, almost to the exclusion of the rest of the world. When foreign lands do appear, it's usually only because they relate directly to the US market at that point (like a source of imported films in the early 20th century). That's not too bad, as the US was definitely the source of developments in the communications market, but just be aware of this limitation. All in all, I enjoyed it, and can recommend it if you want to learn more about this field. Really dug this. Really makes you scared about cult companies like Apple. Read this if you're at all interested in technology, entertainment, communications, or just the future. Wu's book ties together the stories of the evolution of various information technologies into mass media conglomerates and empires in America over the past 150 years. Just as interesting as the parallel paths of consolidation into monopolies is the impact of the various larger-than-life moguls who built these empires. From Theodore Vail and Adolf Zucker to Steve Jobs these men recognized the opportunities of their lifetimes and seized them by the throat. It is instructive to consider this recurring history when anticipating the likely future of the internet. Will the Googles dominate or will it be a new era of Net neutrality? It may be too early to say, but this book makes you aware of the likely scenario that history implies. A good read. An outstanding piece of business history. Even more relevant now than when it was published. A well written account of the similarities between 19th and 20th century cycles of communication technology. Never dry, this is a story of interesting inventors and the villains they came up against or became. Recommended for anyone who wants to understand the Internet in the context of the last 150 years. Perfectly narrated. Complex, inaccessible ideas expertly articulated and illustrated. A wonderful book, highly recommended. Well worth reading.